Glia are the supporting cells of the nervous system. They help to regulate the extracellular environment, myelinate axons and also fill a protective role. Overall, the number of glial cells in the human brain is approximately the same as the number of neurones. The balance varies between different parts of the brain, with the cerebral cortex having around three glial cells per neurone while in the cerebellum there is one glial cell per five neurones. Glial cells do not possss axons or dendrites and are unable to generate action potentials. However, unlike neurones glia can undergo mitosis. As well as their roles in the developed brain, glial are crucial in embryogenesis. The growth cones of immature axons are guided to their general target zone by glial cells. Several different types of glial cells exist. Astrocytes are one of the types of glial cells of the central nervous system. They regulate and optimise the extracellular environment to permit efficient functioning of neurones. This activity involves absorbing the potassium that neurones release during their action potentials and removing neurotransmitters from synaptic clefts and recycling them. Astrocytes also help to anchor neurones structurally. The regulation of cerebral blood flow may involve a contribution from astrocytes and they are important in maintaining the blood-brain barrier, a functional feature of the endothelium of cerebral blood vessels which helps to isolate the neural tissue from some of the constituents of the blood (including infections) and therefore protects neurones. Astrocytes also serve to link the myelinating activity of oligodendrocytes with the electrical activity of neurones. Active neurones release ATP and this stimulates astrocytes to release a substance (leukaemia inhibitory factor) that induces myelination by oligodendrocytes. The repair of damage to the brain also involves astrocytes. Astrocytes can help to remove the debris and then proliferate to provide a physical replacement for the lost neurones, albeit that they lack the information processing actions of neurones and therefore cannot restore the function of the damaged part of the brain. Whereas astrocytes can undertake phagocytosis as part of their array of functions, microglia are specialised immune cells within the central nervous system. They are derived from monocyte precursors in the bone marrow which then make their way into the central nervous system. Within the CNS microglia undertake very diligent, thorough surveillance of the extracellular environment for any infections, foreign material or debris which they then phagocytose. As with macrophages in the rest of the body, microglia have antigen presenting capacity and are integral to the function of T cells within the CNS. They possess cytotoxic properties due to their ability to generate large quantities of hydrogen peroxide and nitric oxide for use in the killing of cells. In addition, microglia can secrete a variety of cytokines that help to co-ordinate the inflammatory response and also are crucial in clearing up debris and damaged tissue and promoting repair. Ependymal cells line the ventricles of the brain and the central canal of the spinal cord. They are actually epithelial cells. Ependymal cells possess cilia which may help to produce flow of the cerebrospinal fluid. Specialised collections of ependymal cells known as the choroid plexus synthesise the cerebrospinal fluid. Oligodendrocytes are the glial cells that myelinate axons within the central nervous system. Each oligodendrocyte contributes a myelin sheath to more than one axon and possibly to as many as 50 axons. Damage to oligodendrocytes is a central aspect of multiple sclerosis but is also found in other, rarer demyelinating diseases of the central nervous system. Schwann cells provide myelin sheaths for axons in the peripheral nervous system. Unlike oligodendrocytes Schwann cells are monogamous. One Schwann cell myelinates only one axon. The myelin sheath provided by a single Schwann cell extends for around 100micrometres along an axon. Thus, one axon will require many Schwann cells. The composition of the peripheral nervous system myelin which is produced by Schwann cells is different from that of oligodendrocyte central nervous sytem myelin, particularly with regard to some of the proteins that are associated with myelin. Diagram of a cross section of one Schwann cell myelinating an axon. The Schwann cells has numerous layers of membrane (orange) bound lipid (yellow) that are wrapped numerous times around the axon. 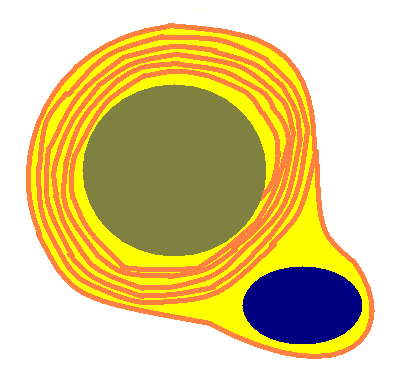 The nucleus of the Schwann cell is shown in dark blue. Illustration of a longitudinal of part of an axon that is myelinated by Schwann cells. 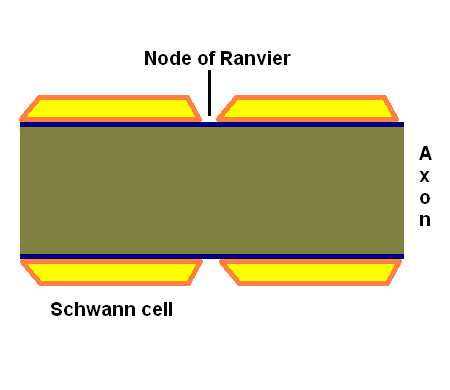 The gaps between adjacent Schwann cells are known as nodes of Ranvier and are vital for the spread of action potentials. 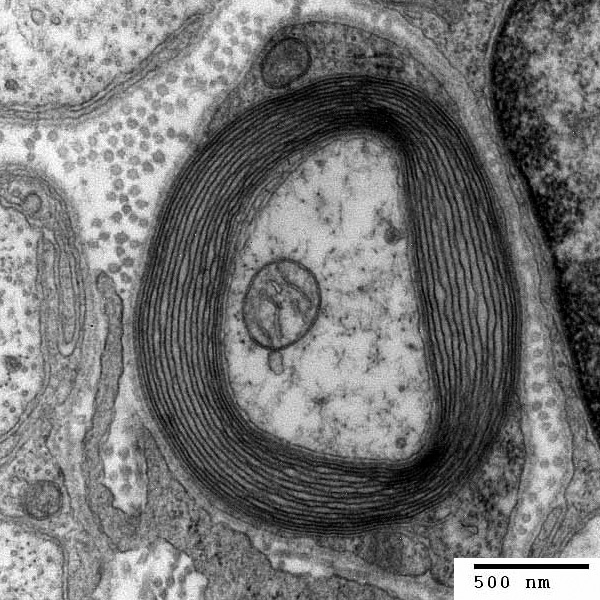 Electron micrograph of a cross section of a myelinated axon. (Image obtained from Wikipedia).